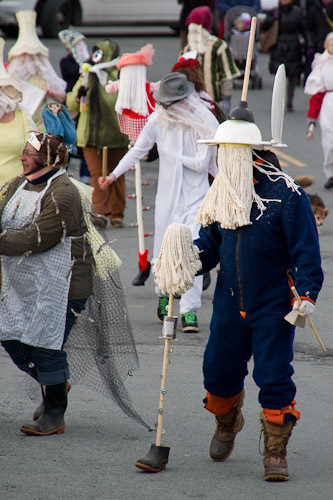 "Mummering", or simply "Mumming", is a fantastic Christmastime tradition still practiced in Newfoundland. 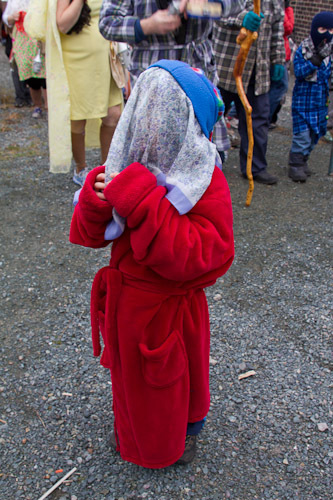 During the 12 days of Christmas, a group of friends and family dress in disguises that hide their faces and go door to door in their community. 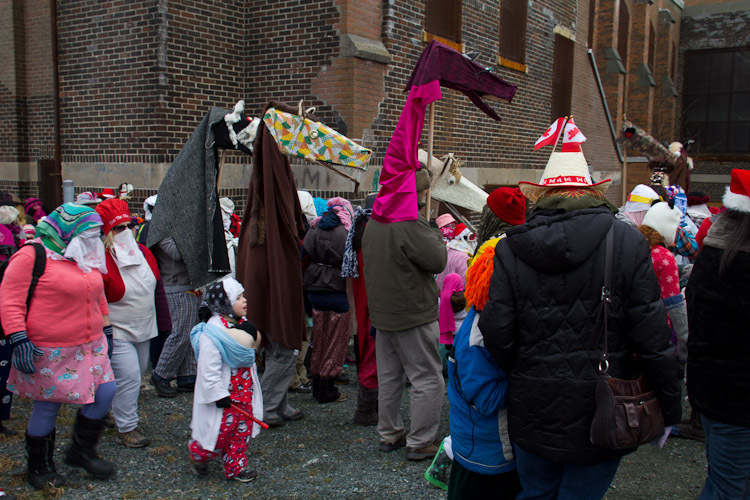 Residents then attempt to guess the identities of the mummers, and may poke & prod them or ask them questions to obtain clues. 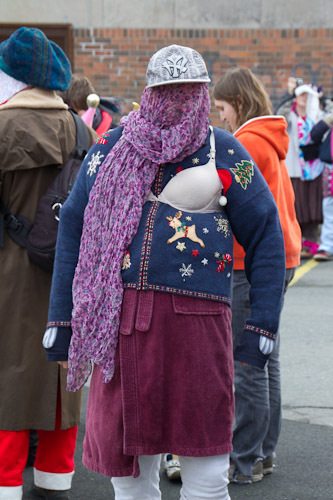 In order to make guessing difficult, mummers will even resort to cross dressing, and nearly always stuff their clothing to conceal their true body type. 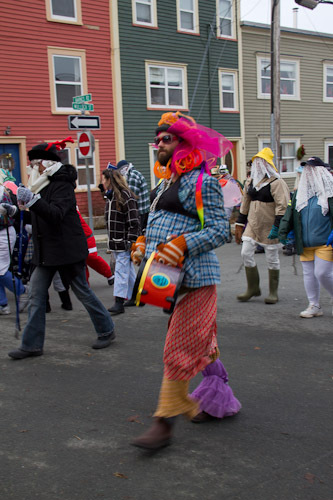 If the mummers are invited in, they'll often perform dances or recite poems and riddles, and the residents will offer them food and drinks, often leading to an impromptu kitchen-party. 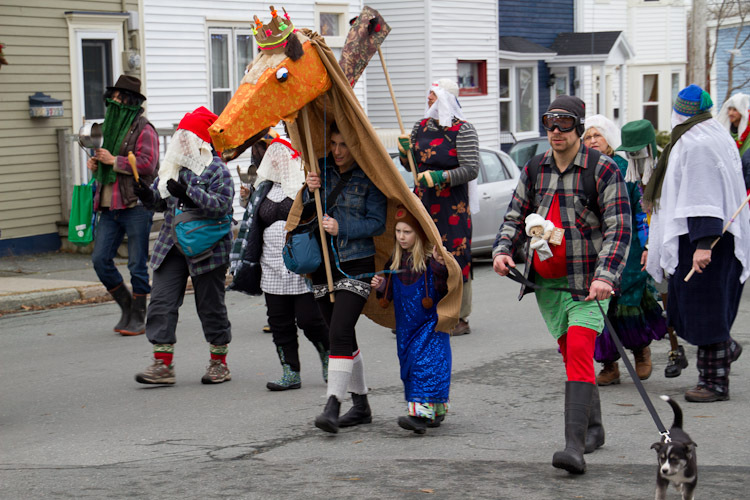 While mummering is still very much alive in the outport communities, the size of St. John's and Mount Pearl has made it less and less common over the years. That is, until the Mummers Festival. 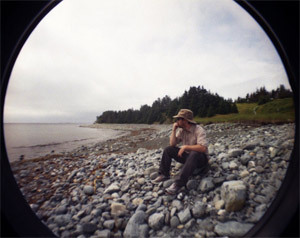 This year it was on December 17th, and Nicole and I decided to check it out with some friends. As come-from-away mainlanders, we had no idea what to expect, so we just packed the camera and some snacks and headed down to Bishop's Field Elementary, where the parade was to begin. 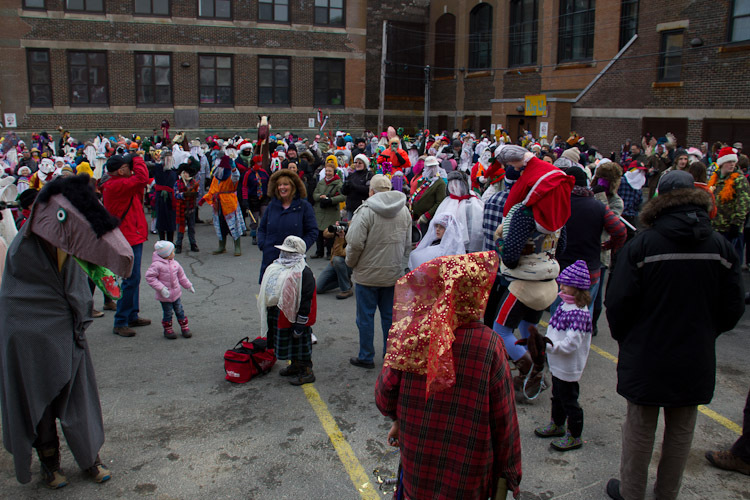 What we saw was a sight to behold, as hundreds of mummers were gearing up for the parade. I smiled so much I had sore facial muscles. It was simply hilarious. My only regret is that I was not participating - If I'd known what it would be like, I surely would have slapped on a size 42 bra and found some means of making obnoxious and excessive noise. 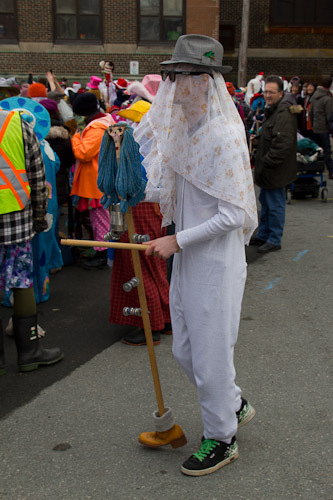 I'm not sure how or why hobby horses became such a part of mummering, but they were everywhere, often with their mouths rigged up with rope so that the operator could open and shut it to make a chattering noise. 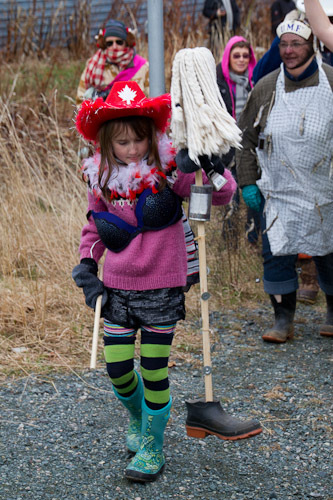 Ugly sticks are part of many Newfoundland traditions, and were definitely everywhere here. Probably my favourite moment was when a small child from the crowd walked out of his way and directly up to me. He stood facing me a few feet off and I took his picture and complimented him on his costume. I didn't recognize that it was Aaron, Nicole's supervisor's son, until his parents walked up and said hello with voices I recognized. He truly had me fooled! 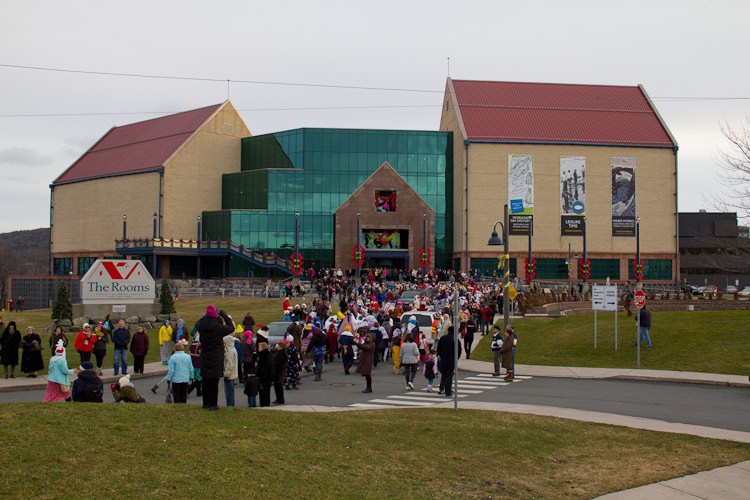 After the parade wound through a few downtown streets, the crowd regrouped in Bannerman park for a brief accordian fueled pow-wow. As the parade leaders began to lead away, I hopped up on a park bench and shot this video, which I hope gives you an idea of just how fantastically crazy the mummer's parade is. The parade continued on through the colourful houses Georgetown. 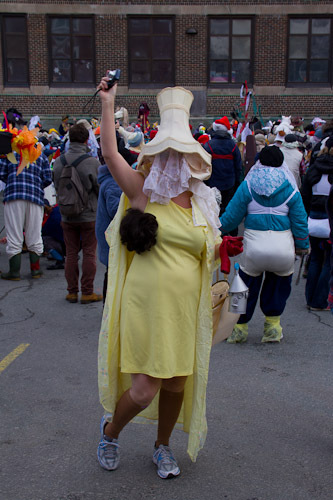 One of my favourite costumes was super style, disco-pimpin' mummer. Finally we reached the Room's where live music, snacks and drinks were waiting for the mummers. There were so many participating that it took quite a while for everyone to file into the building. 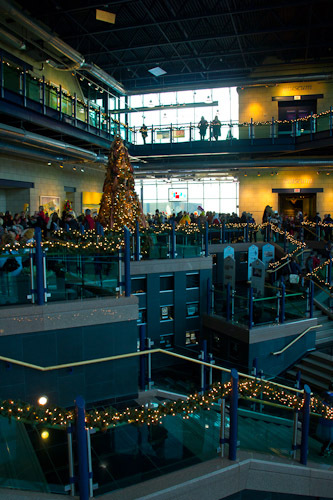 The Rooms had been transformed from a quiet museum to a beautiful Christmas scene.